The Ivory Coast-born flanker became a mainstay for France as a successor to the tried and tested pairing of Olivier Magne and Serge Betsen, having used a surprise call-up for the injured Elvis Vermeulen at the 2007 Rugby World Cup as a springboard to consistent selection. Dusautoir moved to France at the age of 10 and settled with his family in the Dordogne, playing judo before he took up rugby at 16. He started out with Bègles-Bordeaux then had a year with Colomiers before playing two seasons for Biarritz, culminating in the Top 14 final win over Toulouse in June 2006 when he played alongside Betsen and Imanol Harinordoquy in a 40-13 victory. Biarritz lost the Heineken Cup final to Munster the same season and Dusautoir moved on to Toulouse. After making his Test debut against Romania in 2006, Dusautoir starred in the World Cup warm-up win over England in Marseilles in 2007 but he was left out of the opening defeat by Argentina. He then wore the No.7 jersey against Namibia, Ireland, New Zealand, England and in the bronze medal re-match with the Pumas. In doing so he kept the likes of Remy Martin, Imanol Harinordoquy and Yannick Nyanga out of the France side. In the famous Cardiff quarter-final win over the All Blacks he scored France's first try - a fine length-of-the-field effort - and contributed handsomely to an astounding tackle count of 178 to 36 by Les Bleus. Dusautoir's bustling style was used more often on the blindside by new coach Marc Lièvremont in the 2008 Test programme. He is also a useful line-out forward and he started each of the autumn internationals against Argentina, the Pacific Islanders and Australia in the No.6 jersey. He was an ever-present in France's side during the 2009 Six Nations and stood in for the injured Lionel Nallet as captain for the summer tour of Australia and New Zealand that included a famous victory over the All Blacks. He took over the captaincy permanently ahead of the November internationals later the same year and steered his side to another notable triumph against South Africa in Toulouse. Dusautoir captained the French side to the 2010 Grand Slam starting every game. Dusautoir's importance to both club and country was further confirmed as he turned in consistently brilliant performances during the 2010-11 season leading Toulouse to the Top 14 title. The back-row looks set to be a key part of France's World Cup aspirations after being named captain for their warm-up Test against Ireland. And following a typically influential performance, Dusautoir was named captain of France going into the World Cup on August 21. France's campaign was marred by a strained relationship between the players and coach Marc Lievremont. However, despite that and defeats to Tonga and the All Blacks in the pool stages, Dusautoir still led his France team to the final at Eden Park where they lost to hosts New Zealand. 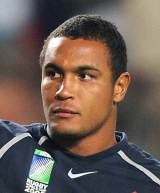 Dusautoir's performances during the tournament, along with his displays throughout the international season, led to him being named IRB Player of the Year for the first time.